My Disneyland history is not, and I admit it freely, what I wish it was and so I generally stay to East Coast topics that I can more easily discuss. This week, however, 5 Kingdoms had such an intriguing article on Disneyland’s Sailing Ship Columbia, that I had to go out and further my own education. My interest was originally piqued in the ship last year while on my honeymoon, when Columbia was not sailing, and the 5 Kingdoms’ article only furthered my fascination. In honor of the article, and to satisfy my own inquisitiveness, this week’s Back Issue comes to us from the Summer 1980 issue of Disney News and fills the sails with the Sailing Ship Columbia’s need to know, and interesting to know, record. On September 30, 1787 an armed merchant vessel commissioned Columbia sailed from Boston Harbor to become the first ship to carry the American flag in oceans around the world. According to her log, she sailed to the Pacific Northwest and on to the Orient where she traded furs for chinaware, tea, spices and silks. When she returned to her home port in August of 1790, she had been at sea for 34 months and had logged a distance of 41,899 miles. During the last months of 1790, the Columbia began her second expedition, again under the command of Captain Robert Gray. During this voyage, Gray discovered the river which today bears the name of the historical vessel. Several more expeditions were made by the Columbia during her proud lifetime. It is believed she finally disappeared without a trace somewhere in the Orient; although one legend has it that she was taken by a crew member and used as a privateer, while still another claims she was wrecked off the rocky shores of Nantucket. The historical significance of the original Columbia was in its establishment of international trade routes and good relations with the West Coast Indian tribes. Its magnificent counterpart, located in the Disneyland Magic Kingdom, establishes a living history of the ship that helped create a Pacific Coast empire for the United States. The fully-rigged, three-masted replica is berthed at Fowler’s Harbor across from Tom Sawyer’s Island in the Theme Park during the winter season. She was dedicated there on June 14, 1958. Research in the Library of Congress and a single steel engraving from the book, “Voyages of the Columbia,” provided the background for the design of the vessel. Her hull was constructed at Todd Shipyards and then completed at the Park by workmen using similar tools to those used on the original ship. 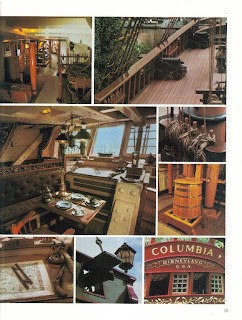 “Below Decks” on the Columbia was opened February 22, 1964. It is an authentic replica of living conditions on the Berth Deck of the original ship… a veritable maritime museum. Visitors see the mess table surrounded by officers’ cabins. The Captain’s Great Cabin astern is furnished with a dining table, two bunks, chart table, and navigational equipment. Along the port side is an exhibit of tackle, blocks, sail, and rope-making gear. There is a forge for tool making and an open-hearth galley on the opposite side for the cook. In the foc’sle are eight (not too roomy) bunks which were for the able and sometimes not too able seamen. Top side, the sturdy Douglas fir planking of the Columbia stretches for an overall deck length of over 83 feet. Her mainmast reaches 84 feet above the weather deck. 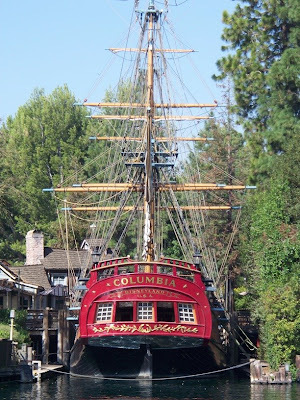 Carrying passengers along the Rivers of America during the summer, the gallant Columbia joins a Disneyland fleet that includes the sternwheeler Mark Twain, keelboats, Tom Sawyer Island rafts and Indian war canoes. But although she is confined to the waters of a river, the Columbia has the proud bearing of her counterpart that once knew the freedom of much vaster expanses… when she was truly an original “gem” of the ocean. Great article and pictures. Love this ship. I missed the Sailing Ship Columbiua on my last DL trip. One more thing to add to the list!